If you're not planning a holiday in the sun this winter - escape the cold with this crisp, citrus, sunshine-inspired scent. TOM FORD Eau De Soleil Blanc, $200. I am having a bit of a love affair with Tom Ford fragrance. My all-time-favourite Is White Suede. It's warm and sophisticated, as well as smelling soapy and clean, the perfect combination of warm, woody amber with velvety rose. But, then along came Eau de Soleil Blanc. It's everything the brand says it will be. A fresh floral drenched in sparkling citrus with a burst of sun-kissed coconut. To quote our style director the moment she sprayed it on her skin. "OMG, this smells like summer. I'm thinking coconut-laced cocktails on the beach - divine." Couldn't of put it better myself. Moroccan orange flower, jasmine nectar, tuberose and ylang-ylang highlight the warmness of the delicious coconut, amber and a pinch of vanilla. In this job, you do get fragrance fatigue. But never with a Tom Ford creation. If fresh, green fragrance are forever on your wish list, then add this new addition from the Ford family. It has a sun-inspired vibe, hard to explain why. Maybe it's the hint of coconut and pistachio, the freshness of bitter orange and the sweetness of jasmine. Whatever it is, we can't get enough of this exquisite cologne. 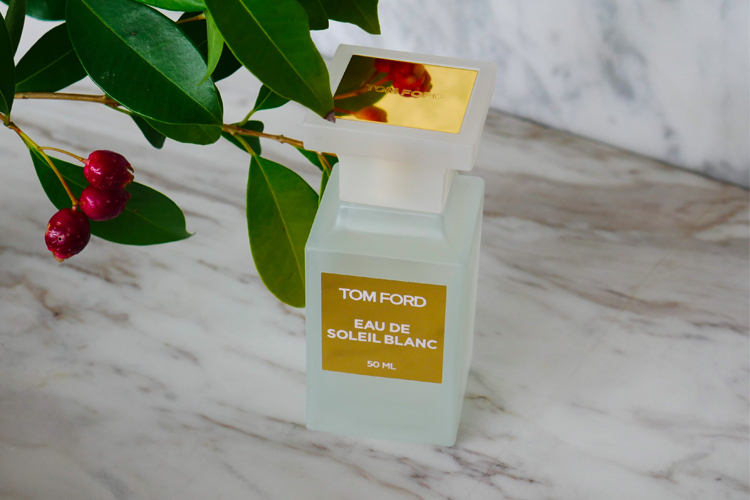 Buy Tom Ford Eau De Soleil Blanc, 50ml, $200 here.